Wednesday 10:00-10:30 Family Reunion Ideas: If you have a reunion coming up, this is the class for you. Come gather many fun ideas to encourage multi-generational conversations and interactions including storytelling, games, crafts, and contests that all incorporate your family's history. You'll also get a sneak peek at our new family reunion activity e-book available this summer! Wednesday 1:30-2:00 Pedigree Challenge: Come take a break and have some fun as we play Family History Jeopardy, enjoy a storytelling contest, and challenge your pedigree chart skills. Prizes for the winners! Wednesday 3:30-4:00 10 Ideas to Zap the Grandma Gap: Family history doesn't have to be boring for your children and grandchildren--make it fun! I'll be sharing my top ideas to help bring generations closer together through activities that engage children in learning about their past. 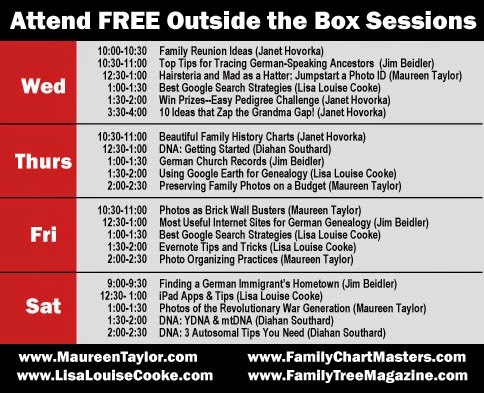 Thursday 10:30-11:00 Beautiful Family History Charts: Now that you have the information, show it off with a custom family history chart. This visual display not only shows off your research, but is also a great conversation starter for family and friends alike. Get the details on how to submit your information, multiple design ideas, and printing options. 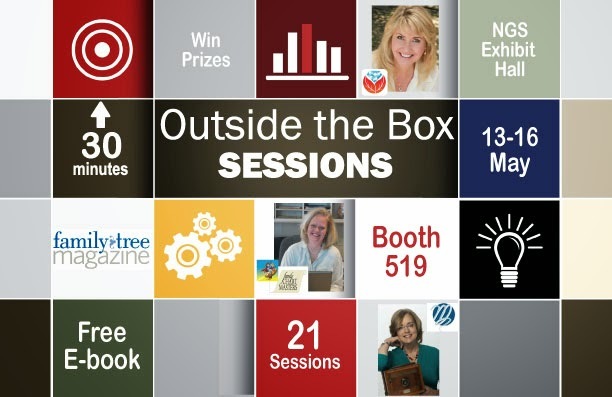 I'd love to chat and visit with you all so hurry on over to the booth on Wed and Thursday. I'll be taking off Thursday afternoon to return home for my oldest son's high school graduation. I wouldn't want to miss this important milestone in our family's history. I'll be sure to have my camera ready to document this special occasion for future generations. Can't wait to show my grandchildren how handsome their dad was on his graduation day!